Recite Japji Sahib. Guru Nanak’s blessing is that the thirty-eight pauris of Japji Sahib can liberate humanity from the cycles of birth and death. The Naad of Jaap Sahib rouses the soul and the self of the being. ‘Sahib’ means ‘grace’. Recite it when your position is endangered, or when your authoritative personality is weak. This Bani brings grace and greatness. It will also give you the ability, that whatever people say, you will automatically be able to compute what they are actually saying. And, once you are able to recite it correctly, it will give you the power, the Siddhi, that whatever you say, must happen. Man can direct God and God can direct man. Guru Gobind Singh recited Jaap sahib so that we would not become beggars at the doors of others. Spoken by Guru Gobind Singh Ji. When you are not getting any satisfaction out of life, this is the Bani to recite. The Bani offers one protection and security and many Sikhs recite this Bani to gain spiritual safety and defence from external and internal enemies, worries and afflictions. The Gurmukhi gives one self-confidence and an upbeat feeling. This Bani can give one the feeling of reliability and dependability on Akaal Purakh Ji. Reciting the forty pauris of Anand Sahib create bliss (anand), because the Guru is limitless. In this Bani, mind and body are explained in relation to cosmic divinity. Guru Amar Das gave us this Song of Bliss to qualify the mind and to understand the depth. Rehraas Sahib Ji -Five different Gurus contributed to the evening prayer Guru Nanak Dev Ji, Guru Amar Das Ji, Guru Ram Das Ji, Guru Arjun Dev Ji and Guru Gobind Singh Ji. Kirtan Sohila Ji – Three different Guru Sahibs contributed to this Paath , Guru Nanak Dev Ji, Guru Ram Das Ji and Guru Arjun Dev ji. This Bani is done before sleep at night. It is the most harmonious Naad ever uttered. It multiplies the aura to the sensitivity of protection that it eliminates any negativity for miles and miles. When you are endangered by any species of direct or indirect source; when you want to protect yourself with the surrounding of the entire magnetic field of the earth, recite Kirtan Sohila. 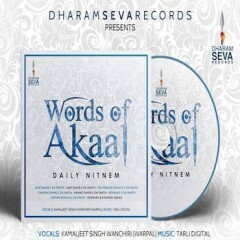 Words of Akaal The album also includes a Morning Ardas and an End Of Day Ardas. Words Of Akaal Daily Nitnem – We urge anybody who obtains a copy of these divine Shabads to treat these with utmost sanctity and respect. The CD will be available shortly and this release will also have a free download online shortly. It should be the objective of the person who obtains this release to be able to recite these Banis using a Gutka Sahib. Try not to fall into a habit of just listening to these banis as they should be recited. Also the same applies for the ardas tracks. We hope these ardas’s will trigger Sikhs to be able to do there own ardas to Akaal Purakh Ji as it is fast becoming a ritual to offer a Gurdwara Granthi a donation and he carries out the ardas for you. Ardas should be performed by one to Akaal Purakh there is not a need for a middle man unless one cannot perform the ardas themselves. We do not wish any offence by the views of our Organisation. No doubt we will make mistakes along the way we humbly request for forgiveness for any offence or mistakes. January 29th sees the release of the Simran Vaheguru by Nindy Kaur and Manj Musik. There will be further publications after the Words Of Akaal release on the importance of the Gurmantar Vaheguru. All proceeds from these releases are non-profit. Vahe-Guru Ji Ka Khalsa Vahe-Guru Ji Ki Fateh.